Would you like to get the smile of your dreams? You can with a smile makeover. 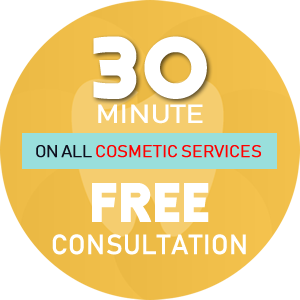 At 7 Pearls Dental, we offer a complimentary 30-minute cosmetic consultation to anyone that’s considering aesthetic services related to a smile makeover. During your visit we’ll discuss if you’re a candidate for particular procedures, whether your mouth is healthy enough for treatment and if other circumstances need to be considered. Depending on your situation, we may recommend a combination of various aesthetic dental techniques to enhance the overall appearance of your smile. 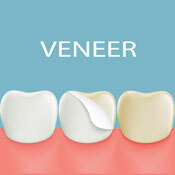 A veneer is a thin shell that covers the front of the tooth it’s bonded to. Dental veneers come in two designs: porcelain or composite resin. 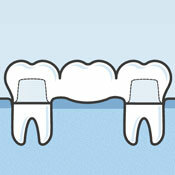 Composite veneers can be completed in one appointment as they’re made chairside by our dentist. On the other hand, porcelain veneers take two visits to complete and require minimal preparation for the tooth as well as an impression, which we send to the lab where your veneers are designed. We want all of our patients to be happy with their aesthetic veneer design and work to ensure that any necessary adjustments are made to see that things are done correctly from the start. Crowns are conservative restorations that protect teeth more likely to break or that have already been damaged in a way that a large filling would cause the tooth to fracture apart even more. Because filling material reacts and flexes differently than tooth enamel, placing a larger filling could compromise the tooth’s structure. 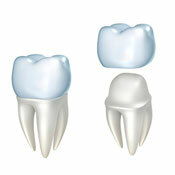 With a crown, the restoration covers and supports the tooth while enhancing the way that it looks. We can match the shade of the material accordingly, so that it blends in with the teeth around it. When a set of crowns are joined together, they can be used to create a bridge that fills in the space where a tooth is missing. Like crowns, the process requires two appointments to complete, with preparation and a mould, followed by a follow-up about two weeks later where the restoration is fitted and cemented to the supporting teeth. The key difference in a bridge is that part of the restoration suspends above the gums but does not affect them in any way as there is no pressure applied to the tissues underneath. 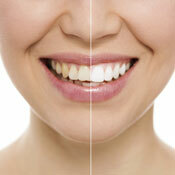 The ZOOM whitening system has provided our patients with excellent results for several years. We offer three intensities (high, medium and low), all of which are completed in-house in about an hour. After placing a protective coating on your gums, we apply the ZOOM solution to your recently cleaned teeth, accelerate the stain-release process with a special light, rinse away the whitening agent and then reapply it three more times. If you tend to have sensitive teeth, we may recommend a special toothpaste to use or adjust your whitening protocol. Find out which type of cosmetic dental treatment is right for your smile by requesting a no-fee consultation!